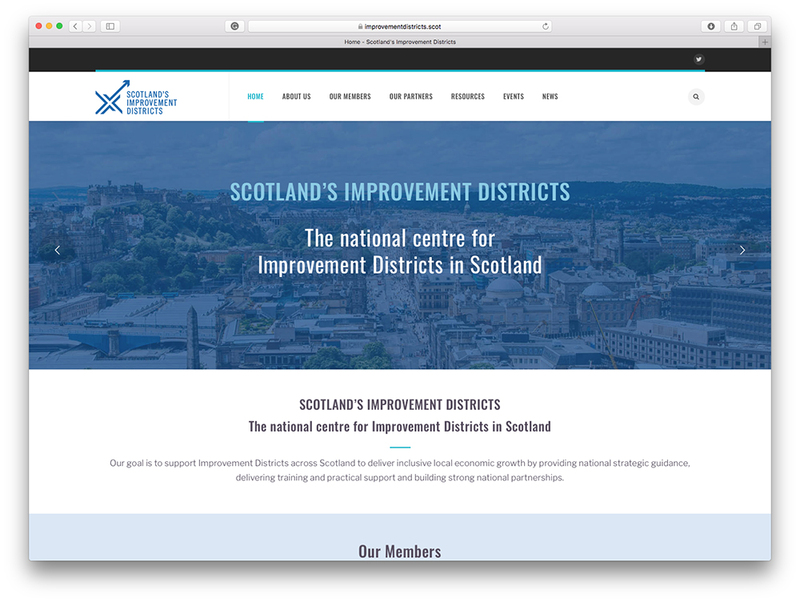 In collaboration with our strategic communications partners, Message Matters, and website development partners, Roslin Design, Brand Satellite have designed new branding and a new website for Scotland’s Improvement Districts. Today sees the launch of Scotland’s Improvement Districts (SIDs), the new national centre for Improvement Districts in Scotland. It’s a vital new initiative from Scotland’s Towns Partnership that will support the operation and growth of the network of Business Improvement Districts (BIDs) across the country. Crucially, though, this is not just about local initiatives – though they are absolutely vital – this is also about the cumulative impact that these innovative and creative local initiatives can have on the inclusive growth agenda for the country. Over the summer, Scotland’s Towns Partnership have been working hard with BID managers and directors, as well other stakeholders, from across the country to understand what they need from their national centre to support their work, and encourage their future success. They have been understanding what has worked well in the past, and what can work better in the future, and reimagining the support systems that will be put in place to ensure even greater success. The new model will be a more innovative, flexible and holistic approach, which leverages greater corporate-community-public partnerships, to deliver the ambitions of local businesses and communities. After all, local businesses and local people are best placed to understand the needs of their local economy.